Option #1: Bus Trip Only. Round trip bus trip to Lambeau Field. Option #2: Bus & Tailgate. Includes a round trip bus trip and an all-inclusive tailgate at Stadium View. Option #3: The Whole 9 Yards. 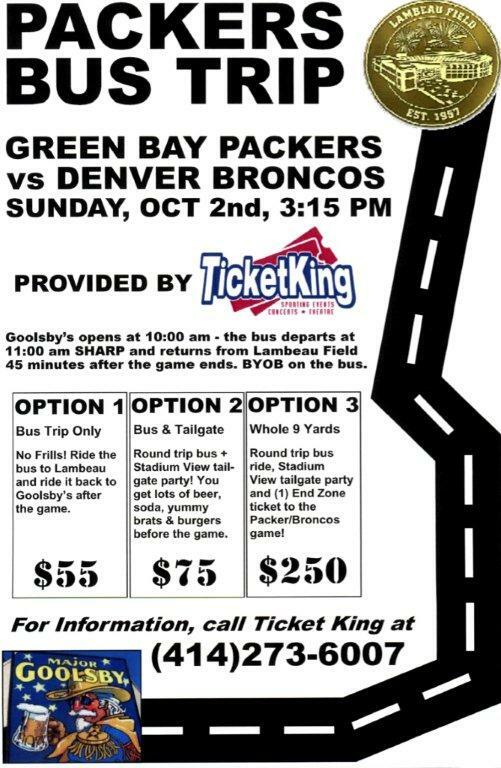 Includes round trip bus trip, Stadium View tailgate, and an end zone ticket to the Packer game. The bus leaves from Major Goolsby's at 11am and leaves Lambeau Field 45 minutes after the end of the game. It's also BYOB on the bus. If you're interested in reserving your spot, give us a call or check us out online!